Then I felt angry at Apple. Long-time master manipulators of the press and of fan-boys worldwide, they could hardly expect calm when the only available reference point was Jobs’ Court Biographer reporting that textbooks were “the next business he wanted to transform. He believed it was an $8 billion a year industry ripe for digital destruction.” Come on Apple. Please don’t use the word “transform” interchangeably with “destruction”, follow that with a “no comment” for the press, and then blame us for speculating that the “big one” was going to detonate. And being disappointed when it did not. Out with a whimper, not with a bang. You can’t disrupt an $8 billion industry with eight multi-gigabyte e-textbooks and 20,000 assorted apps. The weapon of choice? A cobbled-together free software tool, iBooks Author, Mac-only, that makes authors sign away their publishing rights to Apple. And for distribution, let’s stick with the failing iBookstore. Education may well be “deep in Apple’s DNA,” but selling ebooks certainly is not. Adding a very deep insult to injury, Apple, like Amazon before it, crawled all over EPUB 3 and then failed to support the new standard. Thanks a lot Apple for undermining about 50 man-years of great work from the IDPF. Apple is active on the EPUB 3 committees. So what happened? I was surprised also that Apple chose to go after K-12 instead of higher education. The textbooks used for K-12 are arguably better-suited to a dollop of multimedia that higher-ed’s weightier tomes. But text adoption is tougher because you need to convince entire states instead of single professors or schools. And the market is much smaller. 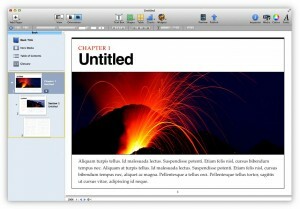 iBooks Author lets you create books that people with disabilities can read and experience. The table of contents, glossary, widgets, main text, and more are built to automatically take advantage of VoiceOver technology. Add accessibility descriptions to any widget or media — including movies and quizzes — so even those with vision impairments can use them. Still, accessibility in EPUB 3 = support for DAISY, yet that’s not part of Apple’s announcement. Color me confused. I found two excellent posts this evening to help put today’s debacle in context. “Apple has a long way to go before it dominates K-12 classrooms the way it has done the music industry,” Sarah Kessler points out, in her thorough overview of how K-12 textbook publishing works. By Apple’s count, 1.5 million iPads are being used by schools. But there are 55.5 million students enrolled in more than 130,000 U.S. schools. No matter how you slice it, the iPad is not a mainstream phenomenon in K-12. I expect we’ll be seeing some revisions to today’s announcements: Steve Jobs was always willing to back down when he was wrong. For me the big takeaway today was a reminder that education does not disrupt easily. Just because textbooks are pricey and printed on paper doesn’t mean that we need to trash them. I’ve worked with a lot of textbook publishers over the last decade and the staff I’ve met are highly-trained and dedicated to producing great books. Yes, it’s profitable for large textbook publishers. But let’s keep the numbers in perspective. JP Morgan’s credible Apple forecasts (PDF file) show that the company will sell nearly $30 billion worth of iPads this fiscal year, which is at least three times the North American revenue from textbook publishing. Apple as a whole is more than 15 times the size of the textbook publishing industry, and many times more profitable. There’s another industry larger than textbook publishing. Computer games. Content alone (without hardware) is twice as large! Content, in context.